This traditional thanksgiving design is perfect for celebrating the season of giving thanks. 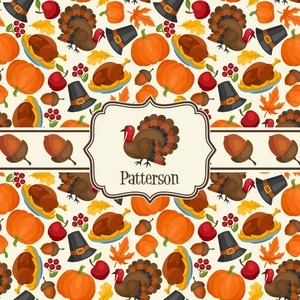 This classic design includes turkey, pumpkin, pilgirm hat, berries, apples, acorns and leaves. The background on this design is re-color-able; and we chose the light yellow from the fall / thanksgiving color palette in our customization system. We chose a ribbon with acorns and a decorative label with a turkey graphic and name personalization.